We are continually acquiring wonderful and rare original antiques and implements Below are photos and information. Inquiries welcomed. 12285r. [photo] Historian Edward Rowe Snow Dropping Christmas Packages at Boston Light c. 1940. Large 7”x9” b/w press photograph by Associated Press shows Mr. Snow in the door of the aircraft as he drops Christmas packages to the Keepers at Boston Light Station. Each year Mr. Snow, wife Anna and daughter Dorothy readied packages for their well known yearly Christmas airdrops to remote lighthouses and Coast Guard stations. In 1926, Captain William Wincapaw began the tradition of dropping Christmas gift packages from his plane to remote lighthouse families. In 1936, author and historian Edward Rowe Snow would continue the “Flying Santa” tradition, which continues to this day by local groups. From 1936 until the 1960’s Snow had completed each year except during World War II. Photo is clean and clear and quite a nice close view including a clear view of Mr. Snow in the door of the aircraft preparing to drop the package. Includes news caption on the back. Dated December 23, 1940. Quite nice, rare. (VG+). $94. 1433. (copy photo) U.S. Coast Guard Station City Point, Dorchester Bay, Boston Harbor, Mass. c.1930’s view. 8” x 10”. Superb, crystal clear image shows the station, men, lifeboats and more. 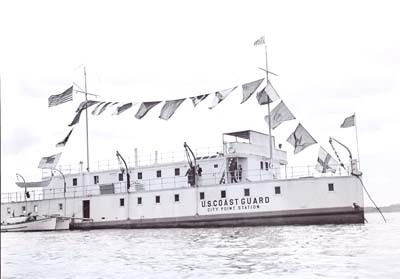 The City Point Life Saving / Coast Guard Station was one of only two such floating stations in the United States . Anchored in Dorchester Bay , she was designed to render assistance in the numerous casualties occurring to yachts and sailboats in that area. She was equipped with a gasoline launch, the Relief, probably the first station in the country to have a power boat. She was constructed in Greenport, Long Island in 1895 and this rare image shows her at anchor, and with her crew and flags flying, probably for a holiday. Clear, close image. (VG+). $29.95 each. 24349b. [chart]. 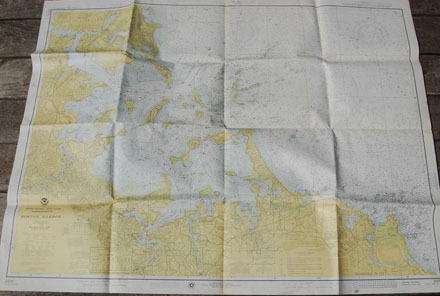 United States Coast and Geodetic Survey. BOSTON HARBOR. Chart #13270. 39th edition of March 1975. Original 5-color chart measures 36” x 46”, on heavyweight paper. Includes all of the coastline and the entire Boston Harbor area from Chelsea and Winthrop south to Cohasset. Includes all lighthouses, lightships and Coast Guard stations, etc. Scale 1” = 700 yards [1/25,000]. Rolled, but with old folds. Clean, no markings, quite desirable for reference or framing. Not for current navigation. (VG+). $58. 28133b. (photo) Boston Lighthouse c.1945. 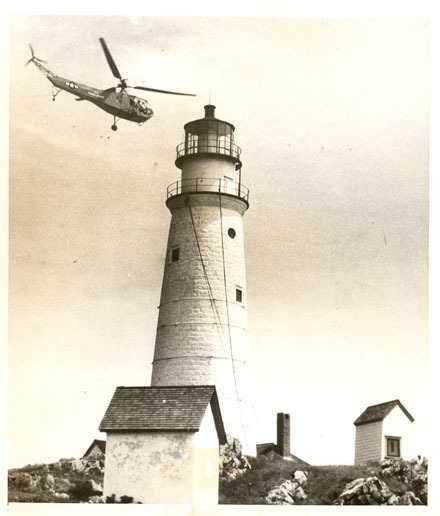 Official Coast Guard photo of the lighthouse, oil house and other buildings as an early military helicopter flies overhead. Official Coast Guard news caption attached to the back notes that the Coast Guard’s newest innovation, the helicopter, flies around the service’s oldest veteran – Boston Light. Dated August 3, 1945. Close, clear, just a bit of a spot from adhesive on back. (VG). $34. 16159. (stereoview) Miss. Helen Bates, Daughter of Lighthouse Keeper, Boston Lighthouse c.1878 by E.R. Hills Photographer. Charming early stereoview features the young daughter of Keeper Thomas Bates at Boston Light Station. Keeper Thomas Bates Jr. took over the station in July 1864 and remained until his death in April 1893. Helen was born in 1873, dating this view to about 1878. The light station was the scene of many happy gatherings during the Bates era. Frequent singalongs took place, with the accompaniment of assistant keeper Edward Gorham on accordion. The station eventually warranted three keepers and their families. It must have been a busy spot with the three familys on the small island and surely young Helen enjoyed a wonderful childhood there. Only very light foxing, a few light stains. 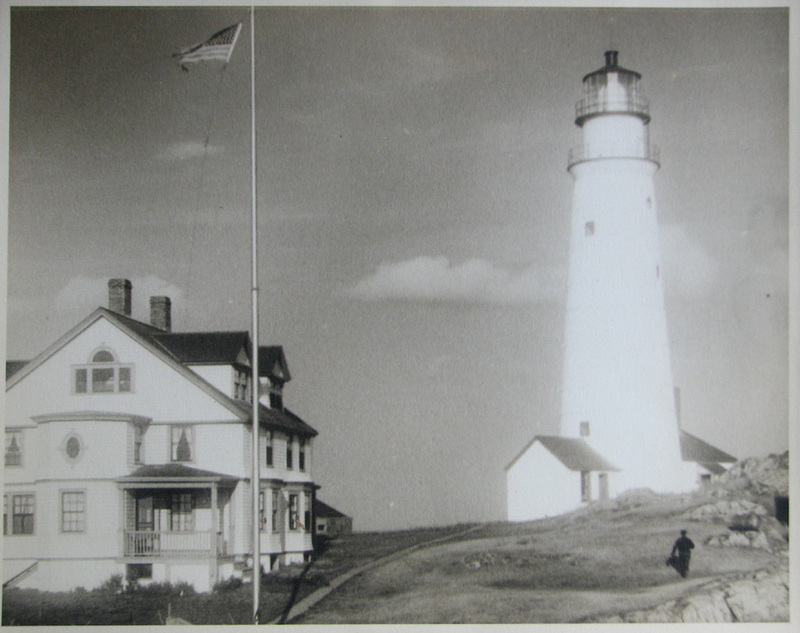 From extremely rare Boston Lighthouse series by photographer E.R. Hills. (VG+). $145. 2073. Snowman, Sally R. PH.D., and James G. Thomson. 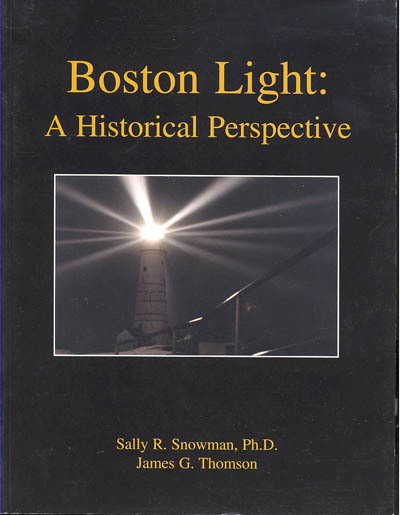 BOSTON LIGHT, A HISTORICAL PERSPECTIVE. Plymouth, Mass. 1999. 280p. Soft wraps. Well illustrated with over 120 photographs (80 in color) and illustrations. This is one of the few books ever book to detail the entire history of America’s first light station and what life was like on Little Brewster Island since 1611. Boston Light Station, established in 1716, is America’s first lighthouse and the only station still staffed by Coast Guard personnel. This most interesting volume presents 283 years of history and is the result of over five years of intensive research. The authors, Sally R. Snowman, PH.D. and James G. Thomson have painstakingly provided the reader with a wealth of information on one of the most historic sites in America. Well supplemented with numerous documents, photographs, floor plans, diagrams and more. Included is a lengthy chronological listing of events relating to the station, listing of keepers, detailed bibliographical notes, and more. Great reading and a most useful reference. Out of print. (M). $55. 24349. [chart]. 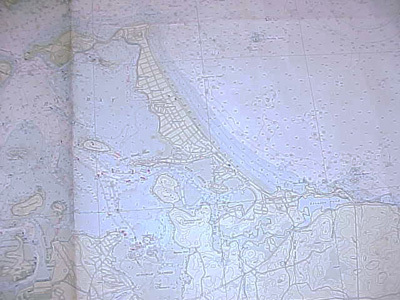 United States Coast and Geodetic Survey. BOSTON HARBOR. From a survey in 1896, 25th edition of March 1948. Original 5-color chart measures 34” x 44”, on heavyweight paper. Includes all of the coastline and the entire Boston Harbor area from Chelsea and Winthrop south to Cohasset. Includes all lighthouses, lightships and Coast Guard stations. Rolled and two folds as original, some expected soiling and wear to edges. Scale 1” = 700 yards [1/25,000]. Chart is quite desirable for framing and is as original. Buoys are highlighted in red. Good for matting and framing. (VG-). $34. 5507h. (stereoview) Boston Harbor Narrows ["Bug"] Lighthouse c.1880. Superb original stereoview by G. W. Tirrell 2nd provides a clear, close view of Boston Harbor Narrows ["Bug"] Lighthouse at low tide. At the railing can be seen the keeper’s family posing for the camera. 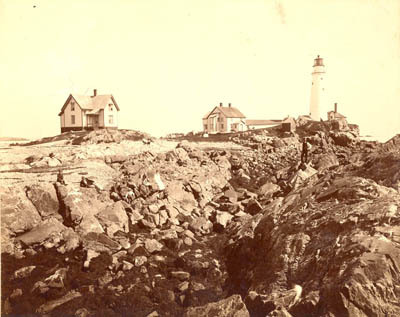 Built in 1856, Bug Light stood until 1929 to warn mariners of the dreaded Harding’s Ledge, four miles to the southeast. The lantern was about thirty-five feet above sea level, and when a sea captain brought Bug Light in range with Long Island Head Light, he knew that he was clear of Harding’s Ledge and could safely enter the harbor. View is clear and clean, just light wear to mount edges. (VG+). $134. 13326. 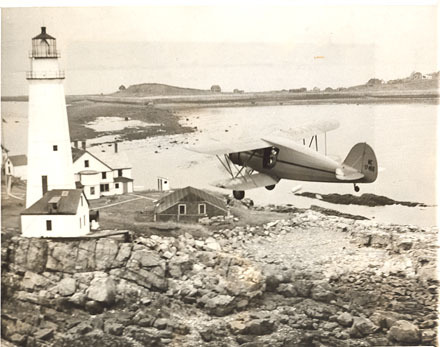 (photo) Boston Light Station – A Stop on Route of Flying Santa Claus” c.1939. 7” x 9”. Clear large b/w press photograph shows a great view of the entire Boston Light Station on Little Brewster Island. Includes keepers’ houses, fog signal building, oil house, light tower, boathouse and more. Description notes that this os one of the stops on the route of Capt. William H. Wincapaw, “Flying Santa Claus”, who carries out annual Christmas Day flight to lighthouses and Coast Guard stations….” Clear, original print, includes date and description on back. Dated December 23, 1939. (VG+). $38. 13139a. (calendar) Victory Ship “Ames Victory” – Boston Light calendar for year 1946. 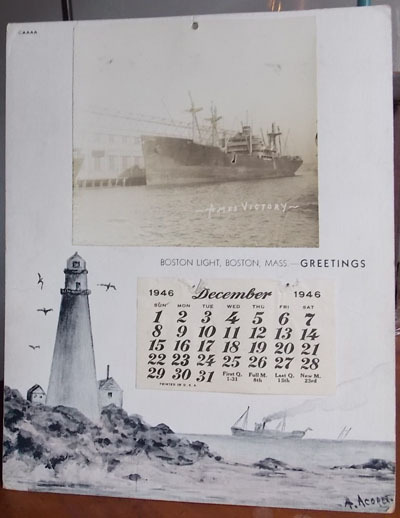 Lovely wall calendar features an actual 4” x 4 ½” photo of the Victory Ship “Ames Victory” in 1945, mounted on a calendar with wonderful print of the artist A. Acorn’s painting of Boston Light . The “Ames Victory” was a U.S. War Shipping Administration vessel launched in Portland, Oregon in 1945. She served at the Battle for Okinawa where on May 4, shell fragments hit the chief mate on board. This ship claimed hits on the plane which crashed into the Birmingham. Calendar sheet is for December 1946. Only light wear, very light soiling. Displays well. (VG-). $22. 13139b. (calendar) Victory Ship “Morgantown Victory” – Boston Light calendar for year 1947. 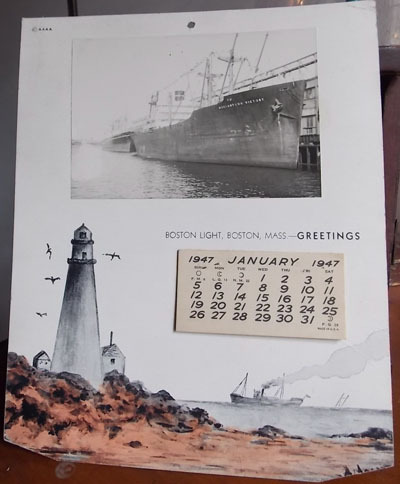 Lovely wall calendar features an actual 4” x 4 ½” photo of the Victory Ship “Morgantown Victory” in 1945, mounted on a calendar with wonderful print of the artist A. Acorn’s painting of Boston Light . The “Morgantown Victory” was a U.S. War Shipping Administration vessel launched in Baltimore in 1945. She served at the Normandy invasion where she was damaged by a mine. Calendar sheets are complete from January to December 1947. Only light wear, very light soiling, bottom corners clipped. Displays well. (VG). $26. Keeper Jennings next to the light. 6721. Jennings , Harold B., A LIGHTHOUSE FAMILY. Orleans . 1989. 1st. 118p. DJ. 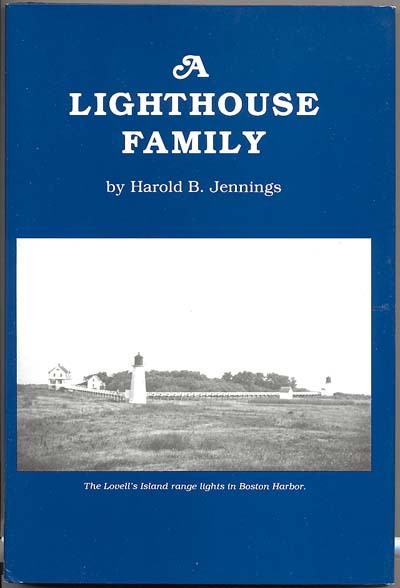 A wonderful narration of boyhood memories while growing up at Lovell’s Island Lighthouse in Boston Harbor . Lovell’s Island Range Lights were erected in 1902 for the accommodation o f mariners coming up the South Channel of Broad Sound, Boston Harbor . The lights were placed in the charge of Keeper Alfred G. Eisener. Known as a poet and a writer, Keeper Eisner is best known for his book Dan, or the Gale of ‘73. In 1919 Eisener was succeeded by Charles H. Jennings, who later transferred to Boston Light. 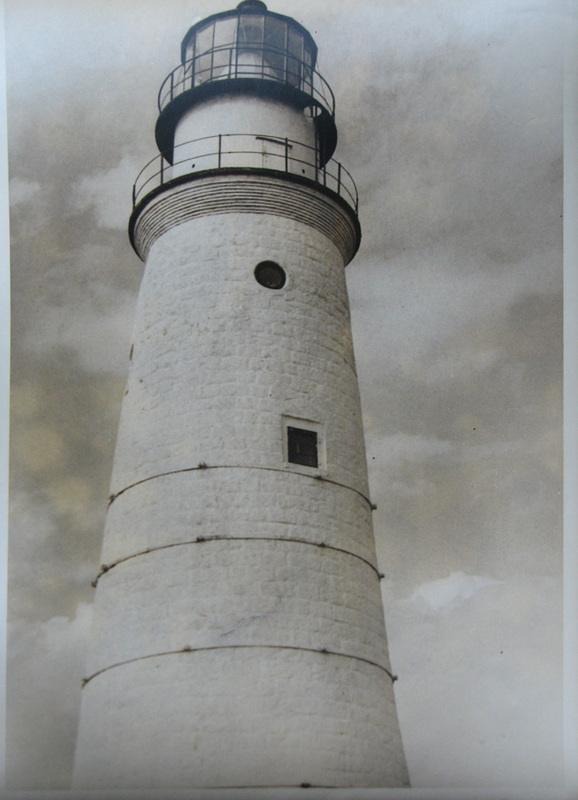 The light was extinguished in 1939 and subsequently torn down. A wonderful story of adventures, shipwrecks, storms, living without electricity and learning how to run a lighthouse combine to provide entertainment and a learning adventure. (F). Special Sale Price $5.95. 12310. (document) Light House Establishment Repair Voucher, Boston Harbor Narrows (Bug) Light Station, Mass c.1860. 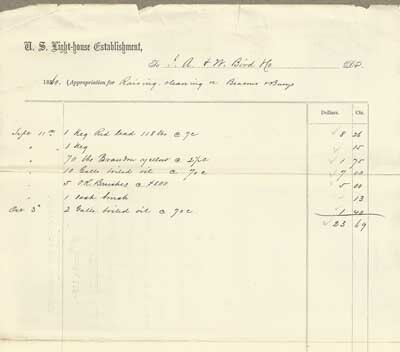 Early pre- civil war document details items purchased and delivered to Lieut. C. N. Trumbull, Light House Engineer, for painting the piles and braces of the Boston Narrows Light Station. Items listed include keg red lead, 70 lbs Brandon yellow, 10 gallons boiled (linseed) oil, 5 brushes, 2 gallons boiled oil, etc. at a cost of $23.69. Dated October 5, 1860. 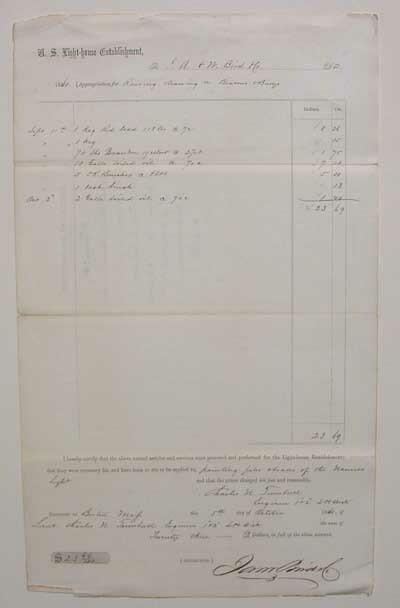 Document is signed by Light House Engineer Charles N. Turnbull. Built in 1856, Bug Light stood, until destroyed by fire in 1929, to warn mariners of the dreaded Harding’s Ledge, four miles to the southeast. The lighthouse constructed was a screw-pile type on iron “legs” (thus its nickname "Bug Light"), with a hexagonal wooden dwelling with galvanized metal roof and lantern perched on top. This lighthouse design was quite unusual at the time and was the first such design constructed in New England . Document is good condition, with original folds, some edge wear to top and bottom. . Measures 8 ½” x 14”. (VG). $64. 12150. (blueprint) Sketch Showing Location of Proposed Protecting Pier at Deer Island Light Station, Boston, Mass. October 4, 1902. 15" x 17". Original blueprint #1432 includes good elevation view of caisson and light tower. Congress appropriated a total of $41,000 for the original lighthouse in 1886. A cylindrical caisson base for the lighthouse, 33 feet in diameter and 30 feet high, was sunk four feet into the gravel of the spit, in about six feet of water. The caisson was filled with concrete, with some space being left for a basement and cisterns. The cast-iron superstructure built on top of the caisson had four levels between the lantern and basement, including living quarters. The lighthouse was painted brown except for the lantern, which was painted black. 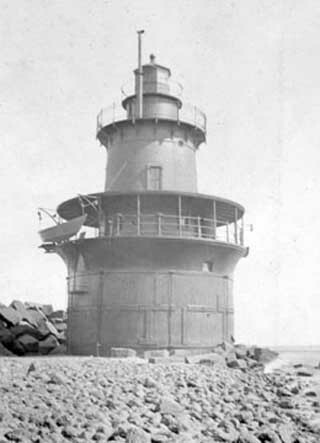 The new light went into service on January 26, 1890. 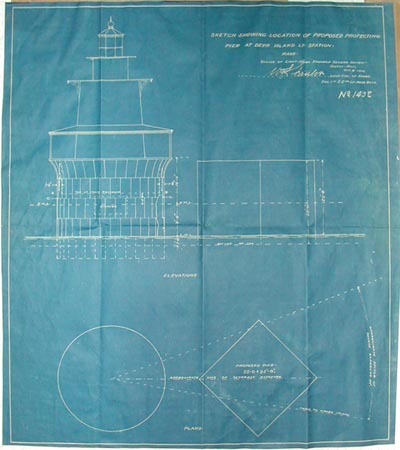 Due to damage and wear from the seas, the protective wall around the base shown in this plan was constructed in 1902 but in spite of the protective wall, the lighthouse continued to deteriorate. The roof over the lower gallery had to be removed in 1965. The keepers did their best with makeshift repairs, but the lighthouse's days as a staffed station were numbered by the early 1970s. Deer Island Light was abandoned on February 19,1972. Beginning on June 14, 1982, the old lighthouse was removed. Clean, crisp, perfect for framing. $235. 12128. 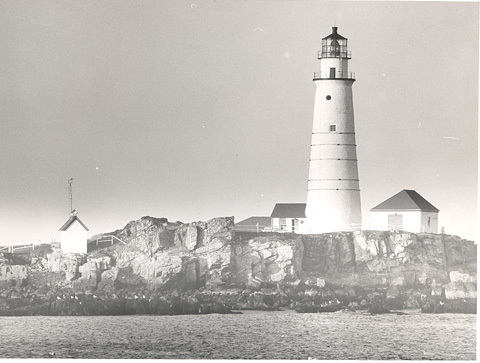 (photo) Boston Light Station c.1960’s. 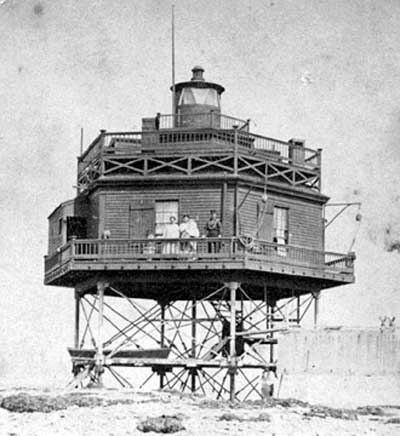 Large 8” x 10” photo provide unusually close, clear views of the light station on Boston’s Little Brewster Island. View includes the tall light tower, fog signal building and oil house, taken from the water. Superb view, clear and clean. Copy photo or digital print. (VG+). $6. 934b. (commemorative toothpick holder) c.1900. A pretty, bright, gilt decorated cobalt blue commemorative toothpick holder featuring a beautiful, detailed full color image of the Revere Beach [Boston] Light House, Boston Harbor, Mass. A rare Boston lighthouse piece, holder measures 3 ½” high and is enhanced by a bright gilt edging. Marked “Made in Germany”. Clean, bright, a very pretty display piece for your collection. (VG+). $56. 12268. Sammarco, Anthony Michael. Boston's Harbor Islands. Arcadia. 1998. 128p. Soft wraps. 180 vintage photographs. First discovered in 1630, the many harbor islands have come to play an integral part in the history and development of the city. 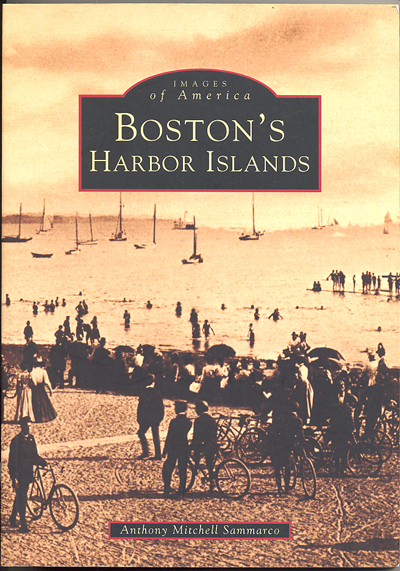 Boston’s Harbor Islands uncovers the fascinating stories of such places as Long Wharf, Castle Island, Minot’s Light, Marine Park, and the Boston Floating Hospital, to name but a few. View the rare photographs of Governor’s Island, and much more. Through a wealth of vintage photographs and descriptive text, the author reveals the history and lore of this historic area. Superb photographs, well worth it for the photos alone. (M). $21.99. 96791. na. Spit Light, Boston Harbor. Ballou’s Dollar Monthly Magazine. June 1861. 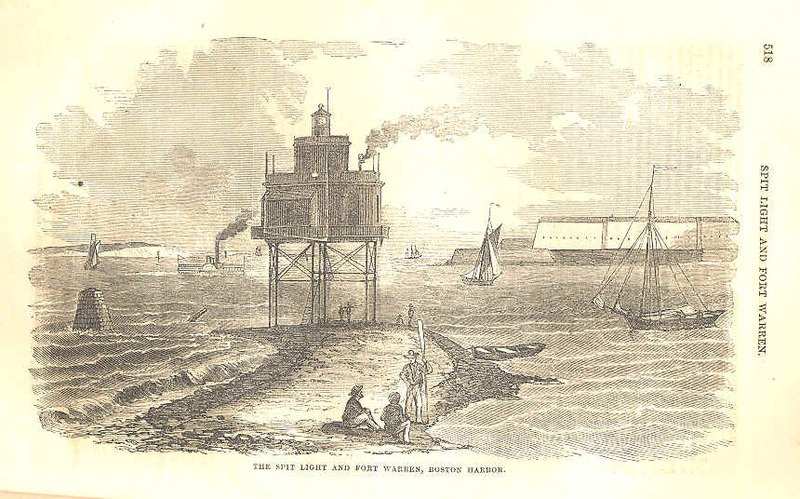 Superb early engraved illustration of Boston Harbor and Boston Narrow’s (Spit) Lighthouse. 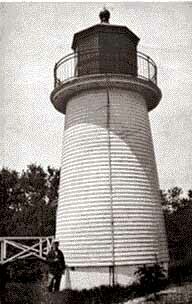 Built in 1856, Bug Light stood until 1929 to warn mariners of the dreaded Harding’s Ledge, four miles to the southeast. The lantern was about thirty-five feet above sea level, and when a sea captain brought Bug Light in range with Long Island Head Light, he knew that he was clear of Harding’s Ledge and could safely enter the harbor. Includes short article describes the scene and this area of the harbor. Full issue, includes numerous interesting articles of the day. Some wear, contents generally clean. (VG-). $22. 25210. 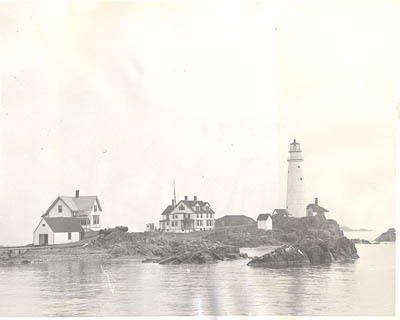 (research – photographs) Boston Lighthouse c.1960. 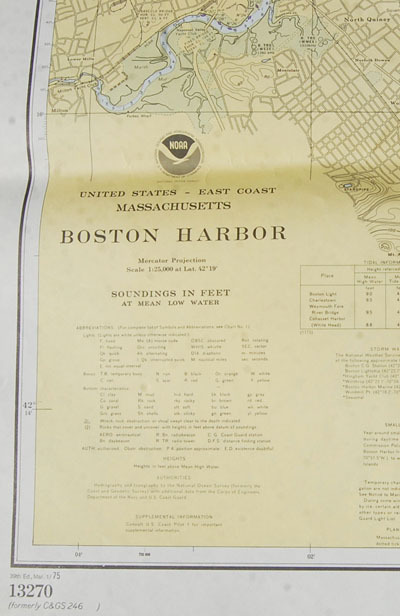 Package of information and research accumulation was compiled by Robert E. Wilson in 1965 for an article in the Worcester Telegram/ Evening Gazette, Parade supplement on the history and pending designation of Boston Lighthouse as a National Historic Landmark. Four official 8”x10” b/w Coast Guard photographs include: photo of Keeper’s houses taken from the light tower including the “Big House”, which was torn down in 1959,. 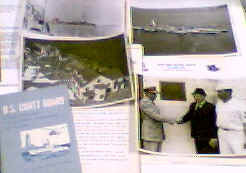 2 photos picturing entire island and structures, and a photo of Rear Admiral James A. Alger, Jr., Commander, First Coast Guard District with Osborne Earle Hallett, Keeper of Nobska Point Lighthouse and former Keeper of Boston Light, and Boatswain's Mate First Class Mike Mikelonis, Officer in Charge of Boston Light. 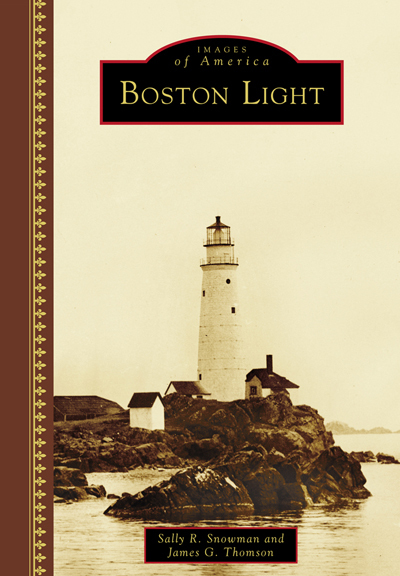 Lot also includes some newspaper articles, letters and press releases from the Department of the Interior on the subject of the designation of Boston Lighthouse as a National Historic Land mark as well as nine pages of the writer’s notes on the history of the light station. Also included are two US Coast Guard pamphlets: COAST GUARD HISTORY CG-213, 1958. 32p. ; US COAST GUARD – A Study of its Origin, Responsibilities, Relationships and Direction. 1963. 41p. An interesting, informative lot. (VG+). $58. 28153. 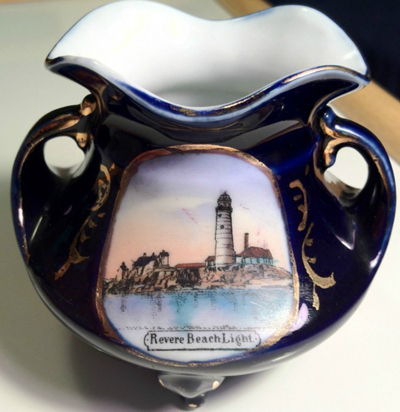 (souvenir dish) “Revere Beach [Boston) Light(house), Mass.” c.1900. 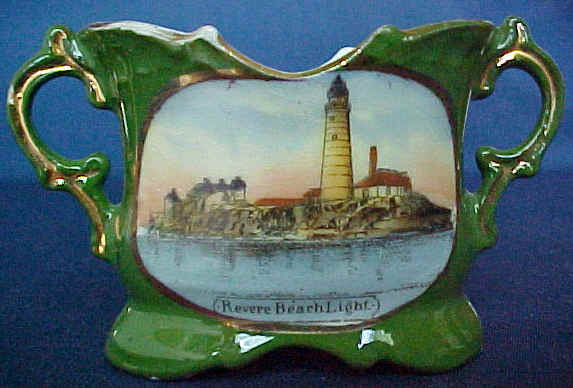 Special early souvenir dish features a beautiful full color image of the “Revere Beach [Boston) Light(house), Mass.”. 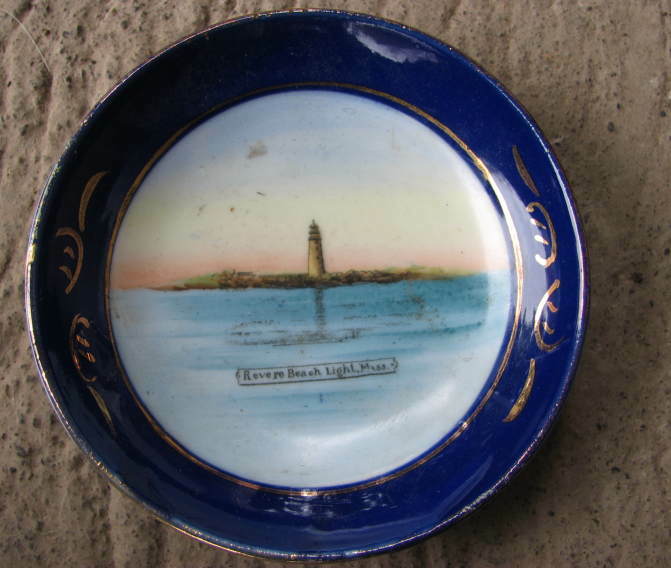 This unusual item is quite attractive and bears a fine though distant, full color image of the tall old lighthouse tower on the rocky point of Little Brewster Island in Boston Harbor. Colorful image is enhanced by the deep cobalt blue rim and bright gilt decoration. This piece is marked “Made in Germany.” 4 1/8” diameter. Clean, no cracks or checks, only light wear. (VG+). $48. 7309f. (souvenir toothpick) c.1900. An unusual, petite, bright emerald green commemorative toothpick holder featuring a beautiful full color image of the “Revere Beach [Boston) Light(house), Mass.”. This unusual item is quite attractive and bears a fine close, full color image of the tall old lighthouse tower, fog signal building and nearby out buildings on the rocky point of Little Brewster Island in Boston Harbor. Holder is quite bright and distinctive, and measures 2” high by 3 ½” wide and is enhanced by a bit of a decorative gilt trim around the image and rim. Labeled “Made in Germany ”. Clean, no cracks or checks, only light wear to gilding and rim. A very detailed, pretty piece for your display, nice coloration. (VG+). $38 net. 7309d. (souvenir vase) c.1900. An unusual, petite, bright cobalt blue commemorative vase featuring a beautiful full color image of “ Revere Beach ( Boston ) Light (house), Mass.”. This unusual item is quite attractive and bears a fine though a bit distant, full color image of the tall old lighthouse tower and nearby walkway on the rocky island. Vase is quite bright and distinctive, and measures 3 3/8” high by 2 ½” wide and is enhanced by distinctive ornate handles on each side, and by a bit of a decorative gilt trim on the handle and around the image and rim. Labeled “Made in Germany ”. Clean, no cracks or checks. A very detailed, pretty piece for your display, nice coloration. (VG+). $56 net. 5231f. OUTER LIGHT-HOUSE, BOSTON HARBOR. Gleason’s Pictorial. March 20, 1852. Fine full page article describing the outer light (Boston Light) and its Keeper Mr. Zebedee, and the inner light (Long Island Head Light). With superb half-page, beautifully detailed engraving showing Boston Light on Little Brewster Island. Masthead depicting Boston Harbor adds to this fine piece. Beautiful bright and clean, fine for display. (VG). $38 net. 28186a,b. (photo) Boston Light Station c.1930’s. 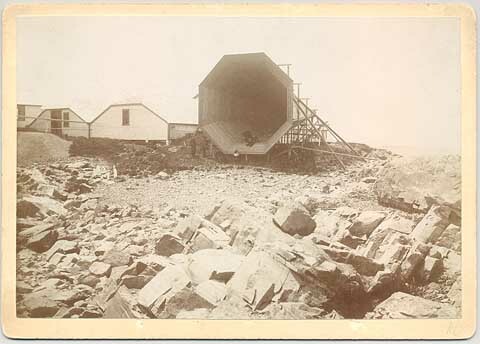 Large 7 ½” x 10” photos provide unusually close, clear views of the light station on Boston’s Little Brewster Island. One view includes the tall light tower and large three-story keeper’s dwelling as one keeper walks up the hill toward the light tower. Second view is a close image looking up at the tower and lantern. Superb views, clear and clean, would look wonderful framed. (VG+). $22 each. 274159. (photos) Boston Harbor Narrows ["Bug"] Lighthouse and Nix's Mate, etc. c.1892-1910. Lot of five 4" x 5" original amateur photos. First is Boston Harbor Narrows ["Bug"] Lighthouse as a tug approaches. Nix’s Mate is visible at the right margin. Additional views include cranes and gin poles, a granite bridge appears under construction, possibly over the Neponset River; magnificent photograph of the Ocean View House, location unknown; Small bay panorama, probably also Quincy; Norfolk Downs, Quincy, Mass., the old Indian lands in North Quincy that was so designated and laid out for house lots in 1892. Parts of the sign on the near building can be read: "-ORFOLK DOWNS – House Lots". Nice Boston area lot. (VG). $36. 28168. 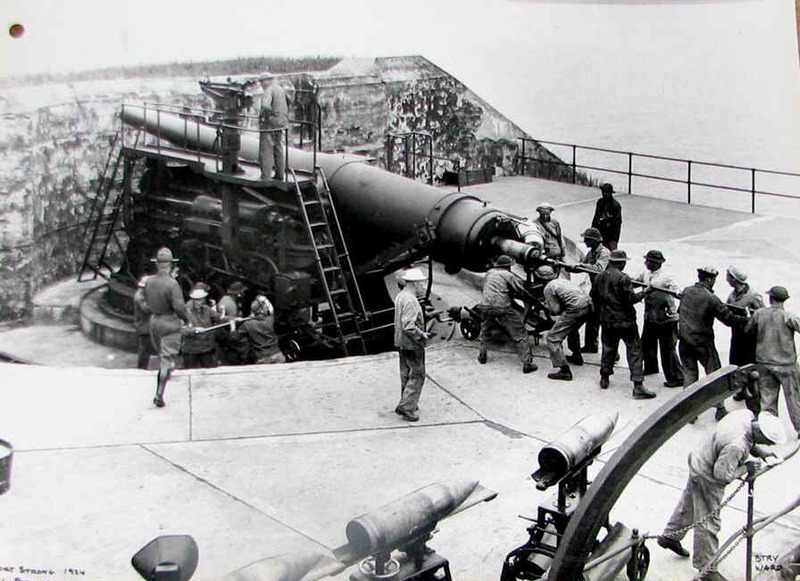 (photo lot) Fort Strong Gun Batteries, Long Island, Boston Harbor c.1912-1944 by Alfred K. Schroeder, photographer. Lot of eight original b/w 11”x14” photographs taken by photographer and historian Alfred K. Schroeder show great detail of the gun batteries and crews at Boston’s Fort Strong. Alfred K. Schroeder was a world renowned photographer, working for as photographer for the Boston Ballet, and was a leading child photographer in the area, in addition to being a military historian and photographer for Edward Rowe Snow. His photographs still hang in museums at around the world. Fort Strong was originally named Long Island Military Reservation until 1899. In World War I, 1,500 soldiers were stationed at Fort Strong but by WWII, its guns were obsolete, and Fort Strong was abandoned. This lot includes 0eight 11 x 14 inch vintage photos of Fort Strong from 1912-1944. All but one are dated; one is dated 1912, four are dated 1924, one is dated 1933, and one 1944. All are on original photo paper and all are in good condition, clear and crisp. Holes punched on one side for album. Rare unusual lot. (VG+). $148. 5307. Boston Light. (c. 1870) Clear, close view showing tower, dwelling and fog signal building. Some foxing to sky . Nice view. (G). $48. 5153. [stereo view] Boston Light [taken from Middle Brewster Island] Clear, clean though slightly distant view by E.R. Hills. (c. 1870-80) (VG) $36. 21104. Finnerty, Cheryl Anne. LIGHTHOUSES OF BOSTON HARBOR – Past & Present. Seminole. 2001. 171p. 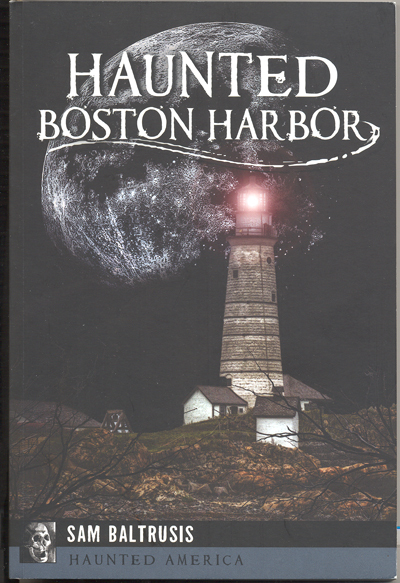 Just published by the founders of the Boston Habor Explorers, this exciting new book features an in-depth narrative history of each of the 19 light stations that have protected Boston Harbor. Each station is covered in detail with a complete history, stories and legends, lists of keepers, architectural specifications, characteristics of the light, as well as present management and visitor information. Included too is information on Life-Saving Services, Joshua James, and more. Stations covered include Boston Light, baker’s Island, Thatcher’s Island, Scituate, Long Island Head, Ten Pound Island, Eastern Point, Marblehead, Straitsmouth, Minot’s Ledge, The Narrows [Bug] Light, Egg Rock, Derby Wharf, Fort Pickering, Hospital Point, Deer Island, Graves Ledge, Lovell’s Island, and Spectacle Island. Well illustrated with 131 vintage and recent photos and diagrams dating back to 1729. Wonderful reading and reference. (M). $24.95. 22240. Sullivan, Robert F. SHIPWRECKS AND NAUTICAL LORE OF BOSTON HARBOR – A Mariner’s Chronicle of More than 100 Shipwrecks, Heroic Rescues and Salvage Accounts, Treasure Tales, Island Legends, and Harbor Anecdotes. Chester. 1990. 164 p. Soft wraps. This thoroughly researched chronicle describes in some detail over 120 shipwrecks in the harbor’s wide expanse, stretching seaward from Deer Island off Winthrop to Point Allerton in Hull. The author describes the harbor’s numerous hazards and violent storms, along with the brave life savers who rescued countless victims. Page after page brings these early seafaring years to life. Well illustrated with numerous vintage photos and engravings. (M). $15.95. 24394. Krebs, Laurie. A DAY IN THE LIFE OF A COLONIAL LIGHTHOUSE KEEPER. New York. 2004. 24 p. New from PowerKids Press, this charming addition to their Day in the Life series looks at Boston Light in Colonial times. From the harbor and lighthouse design, to the keeper’s daily duties, changing weather, firing the fog signal cannon, polishing the brass, rescues and more. A wonderful addition to your children’s library. (M). $18.95. All text and illustrations on web site Ó James W. Claflin . 11/08/2017 All rights reserved. Use prohibited without written permission.